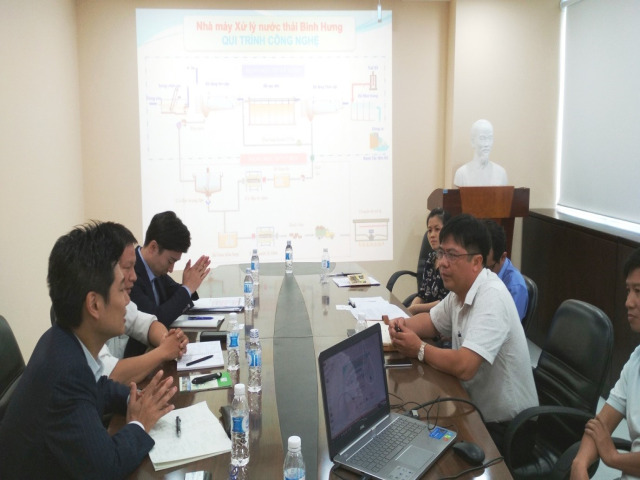 The 30 meter long sewer line, 1500mm in diameter at Cong Quynh - Nguyen Cu Trinh T junction was rehabilitated after 60 days of implementation (from 7 - 12 of September 2015) by SPR technology by Sekisui Chemical Co.,Ltd with support of UDC. With the SPR technology, the rehabilitation work can be implemented without digging road surface. The advanced technology paves the way for rehabilitation of aging arch brick sewers built in French colonial era (over 145 years) in central area of Ho Chi Minh City without erection of fence, without digging road surface, which affect traffic. SPR technology uses PVC profile which is inserted in sewer pipes and wound into circular, square shapes conforming and fitting to host sewer pipes.. The method requires no dig of road surface and only needs access openings (normally manholes) for lowering equipment into sewer pipe. The equipment winds the profile. The profile has locking mechanism that allows interlocking of profile strip to create a new pipe in the host sewer pipe. The annular space between host sewer pipe and the wound profile strip is filled with high strength grout to increase the strength and the impermeability of the sewer pipe. According to the Japanese contractor, in addition to no-dig, also, during the implementation, the technology does not require water flow to stop, which affects drainage capability.